To remove InfoWars and Alex Jones from the public square of YouTube, to destroy what it sees as a political foe, CNN has turned to outright gangsterism. This is an act of extortion, where the gangster promises not to destroy the proprietor’s business if the proprietor agrees to do business in a way that benefits the gangster. This is exactly what CNN did to a number of business owners last week. 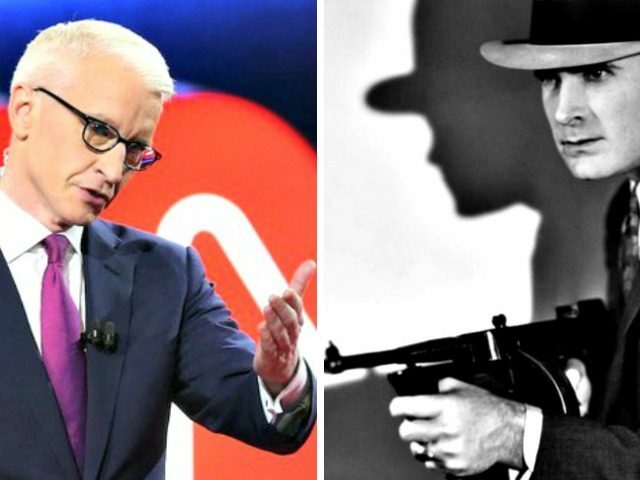 What the gangsters at CNN want is to silence the political right, to chill our speech, to remove us from the debate, to end our influence. And so, because CNN is losing in the open arena of ideas as its ratings bottom out, the anti-Trump cable channel has now decided to silence us using the protection racket — to intimidate our advertisers under the guise of journalism. The CNN story noted here is nothing less than extortion. CNN sent out a reporter to ask various companies why their ads are appearing on YouTube videos produced by Alex Jones and InfoWars. In other words, CNN is not only publicly shaming and outing these businesses, CNN is also threatening that this exposure will lead to astro-turfed harassment campaigns and boycotts. But like the smart gangsters they are, CNN also gives these proprietors a way out, a way to buy protection: drop this advertising and CNN will ensure your business is not burned to the ground. Biases up front — I am no Alex Jones fan. He has some talented people on the payroll, but if InfoWars was to go out of business organically, I would not be able to summon a damn. But I am also a free speech extremist who loves living in a country where Alex Jones is part of the public square. I would say, and have said the same, about anyone on the left. As long as you are not condoning or calling for violence, you should be allowed to say whatever you like on social media — this includes lies and conspiracy theories, because the idea of handing someone the power to decide what is and is not a lie or conspiracy theory is much more frightening than lies and conspiracy theories. There are many forms of free expression that I find toxic. But what is far worse than toxic freedom is oppression, what is far more immoral than toxic speech is silencing that speech. The only thing that should be used to fight free speech is more free speech, and those of us who do not want to hear that speech, or who feel harassed in some way, are all blessed with a block button. YouTube is part of our public square, as are Facebook and Twitter. And if you are banned from any of these speech platforms, you are no longer part of the public debate. Rather, you are in a dark room speaking to no one. This is why the social media crackdown against right-of-center speech is so alarming. After capturing the ways in which Americans communicate with one another, these tech oligarchs are now threatening to exclude us from their platforms if we do not behave, speak, and believe, in the appropriate ways. Like many, I believe a private company should be allowed to run its business however it likes. Social media, however, is different. Imagine if 50 years ago a private company purchased the U.S. mail and the telephone company — now imagine if they monitored and censored our communications based on their partisan speech codes. How is that any different from what corporate fascists in Silicon Valley are up to right now? And now, as a means to silence opinions the establishment doesn’t like, CNN is acting as the muscle, the enforcer, the thugs, the gangsters for these tech oligarchs … Running around and openly intimidating businesses; threatening them with extinction, and by extension, making an example of them to others. Today it is Alex Jones. Tomorrow it is Breitbart News.